I am indeed delighted to meet you today to participate in this award ceremony. I laud the Scouts and Guides Movement in India for its success in developing a wide national network and also in connecting with counterpart organizations throughout the world to spread friendship and cooperation. I am happy to see that your strength has reached a record 51 lakhs. This is certainly indicative of the increasing enthusiasm, in the youth of India, to embrace the motto of "service” and to work for national integration and international harmony. Your guiding dictum, ‘duty to god, duty to others and duty to self’, will ingrain in you spiritual principles that build character. It will impel you to spread the virtues of mutual respect and brotherhood in our society. Through your participation in the Scouts and Guides Movement, you will also realise your own intellectual, physical and spiritual potential. We are, today, only too aware of the social conflicts that can threaten our rapidly transforming society. Our nation is presently transiting through an unprecedented demographic change. In 2020, the average Indian will be only 29 years old. This should indicate how important it is for us to focus, today, on our youth. While we speak of inclusive growth, it is the leaders at the grassroots who will be the agents of change. I am confident that the Scouts and Guides Movement can effectively provide this leadership where it is needed - at the bottom of the pyramid. I would emphasise that in our quest for higher standards of living, we must equally seek to create higher standards of social order. We must be increasingly mindful of the sensitivities of those around us – and how they may be affected by our words and deeds. While we endeavour to eliminate the problems that distort our social development, and as we address imbalances, we must collectively identify the values that have, over the centuries, served to safeguard the pluralistic and secular fabric of our society. And we must reinforce these ethics so that as we go forth into a globalised world, we, as Indians, remain faithful to these unique traditions. Similarly, we must strive to continuously generate greater tolerance and understanding among all sections of our democratic society. Your initiatives can help in the building of national pride among young people and teach them to recognize and reject any narrow and divisive agendas. The Scouts and Guides law of "pure in thought, word and deed” is an excellent principle indeed. In this context, especially, the Scouts, Guides, Rovers and Rangers are fortunate that they have the guidance of Adult Leaders. 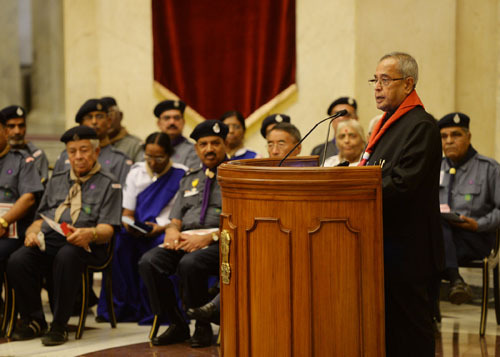 With these words, I once again congratulate all the award winners – including the Adult Leaders of the Bharat Scouts and Guides Organisation for their meritorious and outstanding service. I offer the Bharat Scouts and Guides my felicitations and extend to you my good wishes for the continued success of your endeavours. May you grow from strength to strength.